Solar Ivy (or SMIT Grow) is a spectacular system of thin, fluttering solar panels that generate energy by sparkling in the sunlight. The wind and solar power generating photovoltaic leaves can be easily integrated on the side of a building to produce energy. 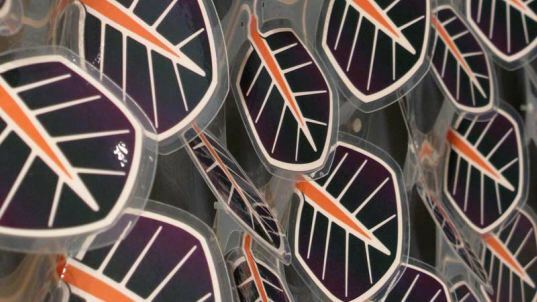 The concept, designed by Brooklyn based SMIT (Sustainably Minded Interactive Technology), consists of a layer of thin-film material on top of polyethylene with a piezoelectric generator attached to each leaf. When the sun is shining or the wind is blowing, energy is being generated via Solar Ivy. We first reported on these photovoltaic leaves over a year ago, and we were thrilled to see them showcased at Dwell on Design last weekend. The Solar Ivy system is modular in nature and made up of ‘bricks’ of 5 leaves which may be scaled to any size necessary. A 4 x 7 foot strip of Solar Ivy is capable of generating 85 Watts of solar power. The advantage of this type of system is that it may be easily mounted on a vertical wall due to its light weight. Another ingenious attribute of Solar Ivy is that its light-sourcing leaves are not static, allowing them to move around and catch the sun from many directions. Due to the organic shape of each panel, they look and act like real leaves, providing a more authentic climbing ivy aesthetic. Watch here how they blow and shimmer in the wind. Designed by a brother and sister super team, Samuel Cochran and Teresita Cochran, the SMIT Grow or Solar Ivy is still in concept phase as they await funding to put their product into play. There are two versions of Solar Ivy – one with the piezoelectric generator and one without. Ideally, they would like to develop both concepts, but costs are prohibitive at this point to include the mini-generator. Over the last year the Cochrans have exhibited at the MoMa Exhibition: Design and the Elastic Mind, and Design Philadelphia, where they were commissioned to outfit a bus stop in Solar Ivy. People who were waiting for the bus could simply plug in their cell phone to charge their battery. Solar Ivy has been featured in a number of magazines and was a concept design for a five-star luxury hotel in Zayed Bay, Abu Dhabi. Most recently, Solar Ivy exhibited at Dwell on Design for the Designboom Kitchen Ecology: Recipes for Good Design. 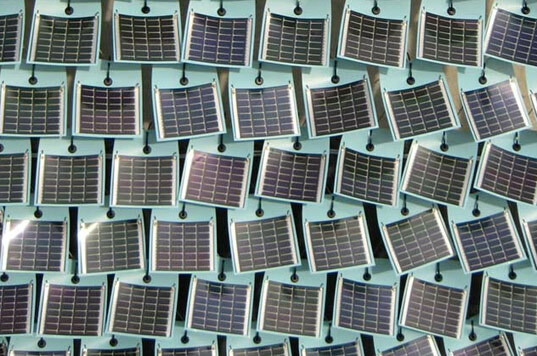 To stay up to date with the latest news on Solar Ivy, check out their Facebook fan page. This is so cool!I have explored solar power from several company's only to find out that it was going to take 15-20 years to recoup my investment and it only produces powen when there is sunlight this is amazing I hope i can afford it! I just saw this creeping solar ivy last night, and now I find this. I was just thinking that it would be cool if there was a solar tree. That would be interesting, and entire tree with leaves of solar collectors, and the trunk is the AC/DC converter box, and then a "root" goes along underground and attaches to the house feeding it the extra electricity. Artistic, pretty, always green, and provides electricity. Neat idea. will they hang there still, after an old fashoined automn storm?? but i do admit it is excellent publicity. great job. Seems more decorative than anything else. Not that that is bad but if you are looking for energy generaton I am not sure this is the way to go. I would prefer a living green wall to fluttering solar cells, myself.